Location, location, location! Impeccable townhome with 1 car garage convenient to everything to include Harbison shopping and interstates just a few blocks away. 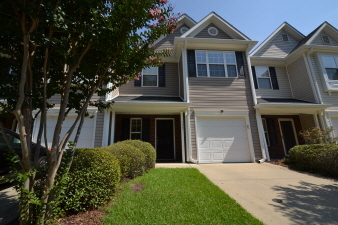 Quaint townhome community offering the wonderful Harbison Community Amenities. This 2 bedroom maintenance free living home offers a super spacious Family Room that open to the Eat-In Kitchen. Kitchen offers stained cabinetry, pantry and opens onto a patio and enclosed back courtyard area; HVAC is only 2 years old; nice updated lighting fixtures; neutral paint throughout; 2 Bedrooms both offer private baths and walk in closets; Master Bedroom has dual vanities, garden tub and separate shower; entire upstairs has been freshly painted; lots of natural light; irrigation and more. Home Warranty offered!